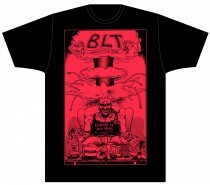 The BLT Kickstarter added a bunch of in-your-face shirt designs today. The art is so over-the-top and I love the themes. 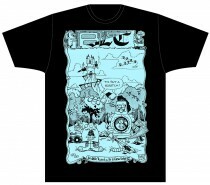 These are apparently going to use some sort of soft screenprinting process which utilizes bleach, so they won’t have any thick plastic feel. My favorites from this batch are the straitjacket guy with his brain exposed for examination and the Coffee is my drug guy with his head exploding. I don’t even have a migraine today, but those just speak to me. Of course, I do get a lot of migraines, so that might be relevant, but I think these T-shirts look good whether or not you currently have a stabbing pain behind your eyes. Posted by Edwina Caustic on Friday, July 24th, 2015. Filed under Headline, Lifestyle, Zines. You can follow any responses to this entry through the RSS 2.0. You can skip to the end and leave a response. Pinging is currently not allowed.